Samba 91-White poses following their championship in the Soccer Spectrum boys' division. Be sure to check out the pages I have constructed for Anatoly's 89 and 90 teams on Doug's D'Feeters Webpage. Check out Doug's photos of the USA Women's National Team. Also, check out photos of Anatoliy and Nasko playing soccer for the Titans. Now for some real action. Coach Anatoliy Dmitriakov demonstrates that he is also quite accomplished at the fine art of disco dancing. (These lessons are actually much more expensive.) The photo also demonstrates just how impressed Queen Soccer Mom Lisa is with the performance. Click on the underlined dates to see the photos. For this season the girls are only playing in the boy U-10 division. Lost to the Rockets 5-3. Were trailing 5-1 at the half but came back in the second half to finish strong. Lost to Diadora approximately 9-2. The girls were actually ahead 2-1 but just ran out of gas as they only had one sub against a tough team. Lost to the team formerly known as the Mesquite Rockets 3-0. Samba started the new season by defeating Force 91 (boys) 3-2. Diadora avenged their earlier loss to Samba approximately 7-3 in the championship game of the abbreviated Fall I session..
Samba jumped to a 4-1 lead and then hung on to win 6-4. Doug forgot to bring film so no photos this week. Defeated the Cyclones somewhat decisively. Won the first game of the new season. 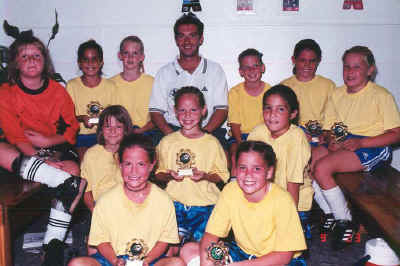 Defeated Dynamite 7-1 to win the girls under 10 division. Defeated Force 90 1-0 to win the boys division. I have no recollection of what happened in this game. Beat the Cyclones 7-1. Grace had 4 goals and Lesia had three. 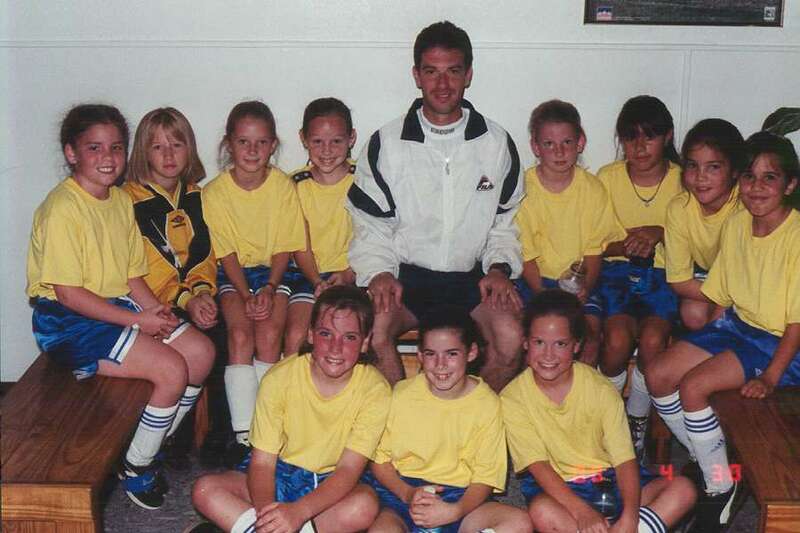 For Summer I the team is playing in both under-10 girls and under-9 boys at Soccer Spectrum. Samba lost. It was a long time ago so I don't remember the score. Lost a very close game 3-2. Won the game 5-2. Lesia made the first goal of the game on a penalty kick. Paige quickly followed up with another goal, and Kellye ended the first half with another goal off of a penalty kick. The first goal of the second half was actually scored by either one of their teammates or their goalie (uh-oh!). Kellye sliced one in next, assisted by both Logan and Grace, and Paige made the final goal of the game off a super pass from Kellye with Molly assisting. The player of the day was Kellye who covered the entire middle from their goal to ours and stopped every attempt they made to get by. Way to play Kellye! These were simply fun photos. Samba had a scrimmage at Soccer Spectrum so I took photos of the bench instead of the action on the field. Defeated Enigma 4-2. I have only been around this team for a little while so I can't tell you who scored the goals. (But my daughter sure is cute, isn't she???) 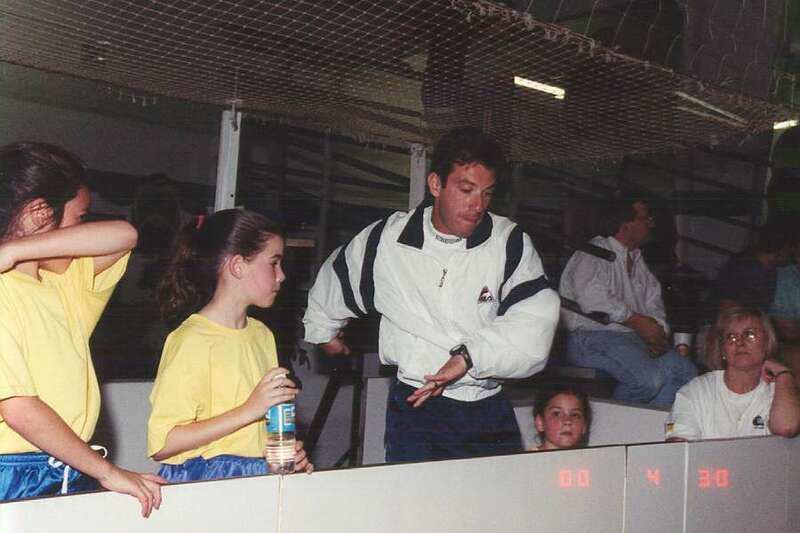 I do know that the goals were scored by little girls with pony tails. Samba defeated the All-Stars 7-0. Took a few photos of this game while waiting for the White game to start.